It is the most prominent building in the Vatican City. Its dome is a dominant feature of the skyline of Rome. Probably the largest church in Christendom, it covers an area of 2.3 hectares (5.7 acres). One of the holiest sites of Christianity and Catholic Tradition, it is traditionally the burial site of its titular, St. Peter, who was the head of the twelve Apostles of Jesus and, according to tradition, the first Bishop of Antioch and later the first Bishop of Rome, rendering him the first Pope. Although the New Testament does not mention St. Peter's martyrdom in Rome, tradition, based on the writings of the Fathers of the Church, holds that his tomb is below the baldachin and altar of the Basilica in the "Confession". For this reason, many Popes have, from the early years of the Church, been buried near Pope St. Peter in the necropolis beneath the Basilica. Construction of the current basilica, over the old Constantinian basilica, began on 18 April 1506 and finished in 1615. At length, on 18 November 1626 Pope Urban VIII solemnly dedicated the Basilica. As one of the constituent structures of the historically and architecturally significant Vatican City, St. Peter's Basilica was inscribed as a UNESCO World Heritage Site in 1984 under criteria (i), (ii), (iv), and (vi). With an exterior area of 21,095 square metres (227,060 sq ft), an interior area of 15,160 square metres (163,200 sq ft), St. Peter's Basilica is the largest Christian church building in the world by the two latter metrics and the second largest by the first as of 2016. The top of its dome, at 448.1 feet (136.6 m), also places it as the second tallest building in Rome as of 2016. The dome's soaring height placed it among the tallest buildings of the Old World, and it continues to hold the title of tallest dome in the world. Though the largest dome in the world by diameter at the time of its completion, it no longer holds this distinction. ^ a b Banister Fletcher, the renowned architectural historian calls it "the greatest creation of the Renaissance" and "... the greatest of all churches of Christendom" in Fletcher 1996, p. 719. Fletcher, Banister (1975). History of Architecture on the Comparative Method for the student, craftsman, and amateur. New York: Macmillan Pub Company. ISBN 978-99974-605-5-4. ——— (2001) [First published 1896]. Sir Banister Fletcher's a History of Architecture (20th ed.). London: Architectural Press. ISBN 978-0-7506-2267-7. Among the persons beatified by Pius XII, a majority are women, with Spanish, Italian and French backgrounds and others. The Cappella Giulia, officially the Reverend Musical Chapel Julia of the Sacrosanct Papal Basilica of Saint Peter in the Vatican, is the choir of St. Peter's Basilica that sings for all solemn functions of the Vatican Chapter, such as Holy Mass, Lauds, and Vespers, when these are not celebrated by the Pope (for functions celebrated by the Pope, the Sistine Chapel Choir sings instead). The choir has played an important role as an interpreter and a proponent of Gregorian chant and sacred polyphony. The Chair of Saint Peter (Latin: Cathedra Petri), also known as the Throne of Saint Peter, is a relic conserved in St. Peter's Basilica in Vatican City, the sovereign enclave of the Pope inside Rome, Italy. The relic is a wooden throne that tradition claims the Apostle Saint Peter, the leader of the Early Christians in Rome and first Pope, used as Bishop of Rome. The relic is enclosed in a sculpted gilt bronze casing designed by Gian Lorenzo Bernini and executed between 1647 and 1653. In 2012, Pope Benedict XVI described the chair as "a symbol of the special mission of Peter and his Successors to tend Christ’s flock, keeping it united in faith and in charity. "The wooden throne was a gift from Holy Roman Emperor Charles the Bald to Pope John VIII in 875. It has been studied many times over the years, the last being from 1968 to 1974, when it was last removed from the Bernini altar. That study concluded that it was not a double, but rather a single, chair with a covering and that no part of the chair dated earlier than the sixth century.The Chair is the cathedra of St. Peter's Basilica. Cathedra is Latin for "chair" or "throne", and denominates the chair or seat of a bishop, hence "cathedral" denominates the Bishop's church in an episcopal see. The Popes formerly used the Chair. It is distinct from the Papal Cathedra in St. John Lateran Archbasilica, also in Rome, which is the actual cathedral church of the Pope. A pope is the Bishop of Rome and the leader of the Catholic Church. Approximately 100 papal tombs are at least partially extant, representing less than half of the 264 deceased popes, from Saint Peter to Saint John Paul II.For the first few centuries in particular, little is known of the popes and their tombs, and available information is often contradictory. As with other religious relics, multiple sites claim to house the same tomb. Furthermore, many papal tombs that recycled sarcophagi and other materials from earlier tombs were later recycled for their valuable materials or combined with other monuments. For example, the tomb of Pope Leo I was combined with Leos II, III, and IV circa 855, and then removed in the seventeenth century and placed under his own altar, below Alessandro Algardi's relief, Fuga d'Attila. The style of papal tombs has evolved considerably throughout history, tracking trends in the development of church monuments. 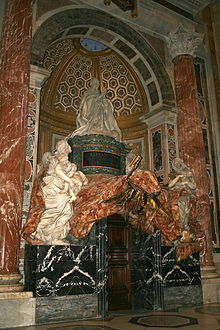 Notable papal tombs have been commissioned from sculptors such as Michelangelo and Gian Lorenzo Bernini. Pope Pius XII (1939–1958) canonized numerous saints, including Pope Pius X and Maria Goretti. He beatified Pope Innocent XI. 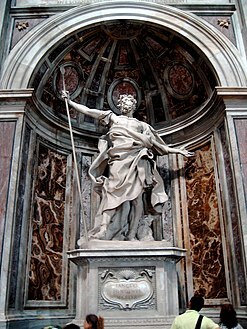 The Monument to the Royal Stuarts is a memorial in St. Peter's Basilica in the Vatican City State, the papal enclave surrounded by Rome, Italy. It commemorates the last three members of the Royal House of Stuart: James Francis Edward Stuart, his elder son Charles Edward Stuart, and his younger son, Henry Benedict Stuart. The Jacobites recognised these three as kings of England, Scotland and Ireland. Below the inscription are two weeping angels, symbolising the lost hopes of the exiled Stuarts. The monument to the Royal Stuarts was originally commissioned by Monsignor Angelo Cesarini, executor of the estate of Henry Benedict Stuart. Among the subscribers, curiously, was King George IV, who (once the Jacobite threat to his throne had ended with the death of Cardinal Stuart in 1807) was an admirer of the Stuart legend. The monument stands towards the back of the basilica in the left aisle opposite the door from which people coming down the spiral staircase from the dome and roof exit. It is frequently adorned with flowers by Jacobite romantics. The monument is not a tomb. The three Stuarts are buried in the crypt below the basilica. James Francis Edward Stuart was buried here at his death in 1766. When Charles Edward Stuart died in 1788, he was buried in the Basilica of St. Peter Apostle in Frascati. When his brother Henry Benedict Stuart died in 1807, both brothers were laid to rest next to their father in the crypt of St. Peter's. Three separate tombstones were erected on the site. Until 1938 the bodies of the three Stuarts were buried where the tomb of Pius XI now stands. In that year the bodies were moved slightly further east on the left side of the crypt, to make room for Pius's tomb. In 1939 a single sarcophagus was erected over the three graves. On top of the sarcophagus is a bronze pillow on which is placed a bronze crown. On the front of the sarcophagus is the same inscription quoted above. ("Maria Clementina, Queen of Great Britain, France and Ireland"). The reference to France is a relic of the Plantagenet claim to the French throne, see English Kings of France. Queen Christina of Sweden, the only other monarch with a memorial in the church, also lies entombed in the crypt below the basilica, with the Royal Stuarts. She abdicated her throne in 1654 to convert to Catholicism. The papal tombs in old St. Peter's Basilica were the final resting places of the popes, most which dated from the fifth to sixteenth centuries. The majority of these tombs were destroyed during the sixteenth through seventeenth century demolition of old St. Peter's Basilica, except for one which was destroyed during the Saracen Sack of the church in 846. The remainder were transferred in part to new St. Peter's Basilica, which stands on the site of the original basilica, and a handful of other churches of Rome. The Pietà (Italian: [pjeˈta]; English: "The Pity"; 1498–1499) is a work of Renaissance sculpture by Michelangelo Buonarroti, housed in St. Peter's Basilica, Vatican City. It is the first of a number of works of the same theme by the artist. The statue was commissioned for the French Cardinal Jean de Bilhères, who was a representative in Rome. The sculpture, in Carrara marble, was made for the cardinal's funeral monument, but was moved to its current location, the first chapel on the right as one enters the basilica, in the 18th century. It is the only piece Michelangelo ever signed. This famous work of art depicts the body of Jesus on the lap of his mother Mary after the Crucifixion. The theme is of Northern origin. Michelangelo's interpretation of the Pietà is unprecedented in Italian sculpture. It is an important work as it balances the Renaissance ideals of classical beauty with naturalism. Pope Anastasius III (died June 913) was Pope from April 911 to his death in 913. He was a Roman by birth. A Roman nobleman, Lucian, is sometimes recognized as his father, although other sources assert that he was the illegitimate son of his predecessor Pope Sergius III (904–911). Almost nothing is recorded of Pope Anastasius III, his pontificate falling in the period when Rome and the Papacy were in the power of Theophylact, Count of Tusculum, and his wife Theodora, who approved Anastasius III's candidacy. Under his reign the Normans of Rollo were evangelized. His papacy faced renewed threats from the Saracens, after they established themselves on the Garigliano river.He was buried in St. Peter's Basilica. Pope Boniface II (Latin: Bonifatius II; d. 17 October 532) was the first Germanic pope. He reigned from 17 September 530 until his death in 532. He was born an Ostrogoth. Saint Peter's tomb is a site under St. Peter's Basilica that includes several graves and a structure said by Vatican authorities to have been built to memorialize the location of Saint Peter's grave. St. Peter's tomb is near the west end of a complex of mausoleums that date between about AD 130 and AD 300. The complex was partially torn down and filled with earth to provide a foundation for the building of the first St. Peter's Basilica during the reign of Constantine I in about AD 330. Though many bones have been found at the site of the 2nd-century shrine, as the result of two campaigns of archaeological excavation, Pope Pius XII stated in December 1950 that none could be confirmed to be Saint Peter's with absolute certainty. Following the discovery of bones that had been transferred from a second tomb under the monument, on June 26, 1968, Pope Paul VI claimed that the relics of Saint Peter had been identified in a manner considered convincing.The grave claimed by the Church to be that of Saint Peter lies at the foot of the aedicula beneath the floor. The remains of four individuals and several farm animals were found in this grave. In 1953, after the initial archeological efforts had been completed, another set of bones were found that were said to have been removed without the archeologists' knowledge from a niche (loculus) in the north side of a wall (the graffiti wall) that abuts the red wall on the right of the aedicula. Subsequent testing indicated that these were the bones of a 60-70-year-old man. Margherita Guarducci argued that these were the remains of Saint Peter and that they had been moved into a niche in the graffiti wall from the grave under the aedicula "at the time of Constantine, after the peace of the church" (313). Antonio Ferrua, the archaeologist who headed the excavation that uncovered what is known as Saint Peter's Tomb, said that he wasn't convinced that the bones that were found were those of Saint Peter.The upper image shows the area of the lower floor of St. Peter's Basilica that lies above the site of Saint Peter's tomb. A portion of the aedicula that was part of Peter's tomb rose above level of this floor and was made into the Niche of the Pallium which can be seen in the center of the image. Scala Regia (Latin pronunciation: [ˈskaːla ˈreːɡia] and Italian pronunciation: [ˈskaːla ˈreːdʒia]; English: Royal Staircase) is a flight of steps in the Vatican City and is part of the formal entrance to the Vatican. It was designed by Gian Lorenzo Bernini. The official entrance to the Apostolic Palace is the Portone di Bronzo at the north side of St Peter's Square. The door opens to the Scala Regia, which leads up to the Sala Regia, which in turn connects to the Sistine Chapel and the Pauline Chapel. Tourists are allowed to climb the staircase to enter the Sala Regia.The Scala Regia was built by Antonio da Sangallo the Younger in the early 16th century and was restored by Gian Lorenzo Bernini from 1663 to 1666. The site for the stairs, a comparatively narrow sliver of land between church and palace, is awkwardly shaped with irregular converging walls. Bernini used a number of typically theatrical, baroque effects in order to exalt this entry point into the Vatican. The staircase proper takes the form of a barrel-vaulted colonnade that necessarily becomes narrower at the end of the vista, exaggerating the distance. Above the arch at the beginning of this vista is the coat of arms of Alexander VII, flanked by two sculpted angels. At the base of the stairs, Bernini placed his equestrian statue of the Roman emperor Constantine the Great. It is meant to display the event, before the Battle of the Milvian Bridge when at Saxa Rubra north of Rome along the Tiber, Constantine sees a vision of the cross with the words In Hoc Signo Vinces (In this sign, you will conquer). The phrase appears prominently placed as a motto on a ribbon unfurled with a passion cross to its left, beneath a window over the Scala Regia, adjacent to the statue of Constantine. Emperors and other monarchs, having paid respects to the Pope, descended the Scala Regia, and would observe the light shining down through the window, with the motto, reminiscent of Constantine's vision, and be reminded to follow the Cross. In Bernini's statue of Constantine, he is awed and his horse rears, as Constantine realizes that he will win only with the power of the Christ. The moral of this story would not have been lost upon royal visitors to the pope, or for that matter, Cardinals accompanying a deceased pontiff's cortege, who are meant to see the leader of the church as the embodiment of the divine power that over-rules the kings of the world. This theme is often repeated in Vatican artworks such as Giulio Romano’s fresco of The Battle of Milvian Bridge, located in the Sala di Costantino ("Hall of Constantine") as well as the marble relief in St. Peter's of Algardi’s Fuga d’Attila. 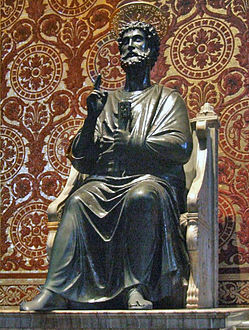 Pope Clement IX later installed a sculpture of Charlemagne in the opposite portico of St. Peter's Basilica as a pendant to that of Constantine. St. Peter's Baldachin (Italian: Baldacchino di San Pietro, L'Altare di Bernini) is a large Baroque sculpted bronze canopy, technically called a ciborium or baldachin, over the high altar of St. Peter's Basilica in the Vatican City, the papal enclave surrounded by Rome, Italy. The baldachin is at the center of the crossing, and directly under the dome of the basilica. 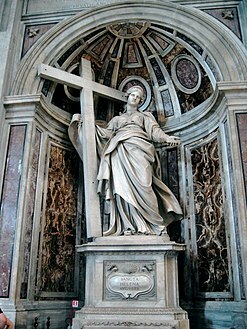 Designed by the Italian artist Gian Lorenzo Bernini, it was intended to mark, in a monumental way, the place of Saint Peter's tomb underneath. Under its canopy is the high altar of the basilica. Commissioned by Pope Urban VIII, the work began in 1623 and ended in 1634. The baldachin acts as a visual focus within the basilica; it itself is a very large structure and forms a visual mediation between the enormous scale of the building and the human scale of the people officiating at the religious ceremonies at the papal altar beneath its canopy. Vatican Hill (; Latin: Mons Vaticanus, Italian: Colle Vaticano) is a hill located across the Tiber river from the traditional seven hills of Rome. It is the location of St. Peter's Basilica.